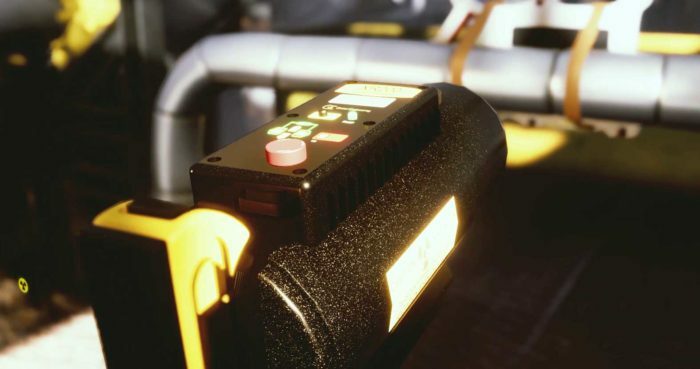 Houston, March 20, 2019 – Oceaneering International, Inc. (“Oceaneering”) has launched a new digital radiography solution for the oil and gas sector, the Trip Avoidance X-ray Inspection (TAXI™) system, aimed at reducing the number of unplanned shutdowns. Recognized as a finalist at this year’s SPE Offshore Achievement Awards’ “Innovator” category, the TAXI™ solution represents a step-change in industrial radiography operations. Typically, radiography uses gamma radiation emitting isotopes. This upsets nucleonic level control instrumentation on pressure vessels and equipment, causing “trips” that result in costly unplanned plant shutdowns and associated process safety risks. The TAXI solution enables Oceaneering’s technicians to digitally radiograph pressure piping and infrastructure associated on, or around, equipment fitted with nucleonic detectors. The work can be carried out while the plant is in-service, using a specialized system that delivers pulsed X-rays. The field-proven process provides the optimal non-destructive testing (NDT) solution to detect corrosion, pipe thinning and potential loss of integrity. It ensures continuous operations – significantly reducing the risk of loss of primary containment (LOPC), associated safety risks and also maximizes plant uptime. Jim McNab, Radiation Methods Subject Matter Expert at Oceaneering, said, “Operators often defer radiography inspections into planned shutdowns or rely on less effective inspection methods. This is because, until now, there was no safe, reliable solution to enable equipment and piping systems to be radiographed in the vicinity of nucleonics while the plant is live. We were compelled to develop an efficient and reliable solution for our oil and gas customers that would provide further confidence in the integrity of their facilities; and took inspiration from X-ray systems used within the security and defense sectors. Oceaneering is a global provider of engineered services and products, primarily to the offshore energy industry. Through the use of its applied technology expertise, Oceaneering also serves the defense, entertainment, renewables and aerospace industries. Trade Shows Oceaneering is a global company, spanning several industries such as the offshore energy industry, defense, entertainment, material handling, aerospace, science, and renewable energy industries. Because our work is global, we strive to showcase our talent, expertise, technology and services worldwide at several important and high-profile trade shows per year. At Offshore Technology Conference in Houston, as well as European-centric trade shows like Offshore Northern Seas (ONS) and Offshore Europe, Oceaneering displayed a touch screen that allows users to bring our technologies and services to life with in-depth facts and figures, and informative videos. Another highlight of our conference stand is the live, mobile mission control center, which provides a look at our collaborative and operational onshore base, supporting all kinds of operations both on- and offshore, topside and subsea. The MSC allows you to optimize resources, hence reducing cost, lowering HSE risk, and lowering emissions to the environment. Trade Shows allow Oceaneering the ability to meet with the public and potential clients to give them more in-depth knowledge about our specialized tools and services. By meeting with Oceaneering’s subject matter experts about our offerings, clients and potential clients can get an open window into the types of services Oceaneering can provide. Oceaneering’s expertise covers the spectrum from remotely operated vehicles, subsea hardware, asset integrity, flow assurance, diving, survey and mapping, vessels, well intervention, workover control systems, pipeline repair, inspection, non-destructive testing, decommissioning, entertainment systems, renewables, umbilicals, valves, marine services, product testing and qualification, data management, vessel navigation and positioning systems, science and other research, and even space systems. Our experts are sought out for their knowledge and experience, to shed light on the latest innovative technology and trends within the wide-ranging industries we serve. They work closely to devise solutions to problems that couldn’t be solved otherwise. We demonstrate our value every day, striving to complete projects on-time and on-budget. Trade shows, including smaller, local meet-and-greets, help tell our story and showcase the expertise and innovation behind our tools, technology, and services. We aim to not only solve the unsolvable but demonstrate our value and expertise as a company, every single day, on every single job, all across the world. We hope to serve you soon. Brochures Our brochures section allows users to read more in-depth about our specialized tools and services that span several industries, such as the offshore energy industry, defense, entertainment, material handling, aerospace, science, and renewable energy industries. By reading more about our offerings, clients and potential clients can get an open window into the types of services Oceaneering can provide. Oceaneering’s expertise covers the spectrum from remotely operated vehicles, subsea hardware, asset integrity, flow assurance, diving, survey and mapping, vessels, well intervention, workover control systems, pipeline repair, inspection, non-destructive testing, decommissioning, entertainment systems, renewables, umbilicals, valves, marine services, product testing and qualification, data management, vessel navigation and positioning systems, science and other research, and even space systems. Our Brochure section features a searchable web database, where users don’t have to simply scroll to find the items for which they are searching. Simply enter your search terms, and select either “exact” or “search title” to help get you closer to relevant technology and services from Oceaneering that can help you solve your needs. Users can also filter their searches by category. Oceaneering offers 40 categories and sub categories to help users find what they need even faster. With a database of nearly 200 brochures, we aim to make the search process as easy as possible so we can get in touch faster to provide you with top-notch service and world-class expertise. Our experts are sought out for their knowledge and experience, to shed light on the latest innovative technology and trends within the wide-ranging industries we serve. They work closely to devise solutions to problems that couldn’t be solved otherwise. We demonstrate our value every day, striving to complete projects on-time and on-budget. Our brochures help to tell our story and showcase the expertise and innovation behind our tools, technology, and services. We aim to not only solve the unsolvable but demonstrate our value and expertise as a company, every single day, on every single job. We do this work with much importance placed on safety, because safety is instilled in every worker, in every region in which we do business. We hope to serve you soon.